edit: since so many asked, the sandals i'm wearing are gee'wawa maria fisherman in grey. another week gone by. i really can't believe it's march already. those couple months of being sick have made me feel like i missed a good portion of this winter, but oh well. i'm just glad to be up and about! i decided it was time for another garter stitch project and this simple baktus pattern was super quick and fun. i would have finished it in one sitting instead of two had i not set the scarf down, picked it back up and started increasing every other row instead of every fourth row! even though the sudden jut where i changed the increase rate caught my attention over and over, i kept knitting away until the halfway point when the decreasing instructions made me realize what i had done. my lazy self considered leaving it, but i really wanted a less dramatic triangle than what i had made, so out it came. even though i had to knit half the scarf twice, this pattern is still a new favorite. 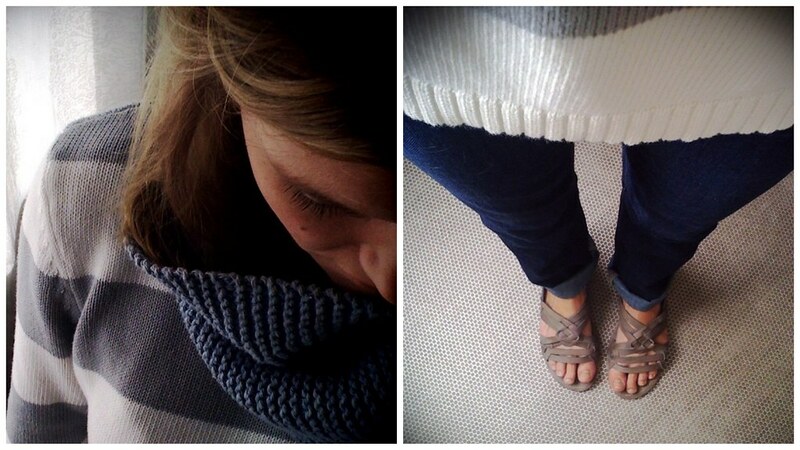 and the cotton peaches and creme in faded denim really made this a perfect scarf for the quickly approaching spring. Love your baktus & your always-lovely quiet, simple photos. thank you, erin kate! i always wonder if simple is boring, so it's nice to hear it's not! this just proves to me that you are a much better knitter than i! you see i started this pattern years ago, only mine was made with white and red stripes in a more fidgety yarn. i STILL have not completed it! I think I am 3/4 of the way done? I hate that I put off projects so easily. i just need to find all my half finished projects and sit down and make myself complete each one. really, i'm so pitiful with my knitting. but your scarf inspires me to finish mine! love the color and the yarn you chose! also, LOVE your sandals! if i might ask, where'd you get them? man anna, i want to see your red + white version! i do that too, put something away when it's so close to being finished. i have such a short attention span and there are so many amazing things to (start) knitting out there! finishing things is so rewarding, so that reminds me to go back and finish what i start. also, no way, i just had some time on my hands while i'm bouncing back and forth between not feeling good and getting better. it's nice to have something to keep me busy while i'm forced to slow down. i'd go crazy otherwise. and thanks on the sandals! doug got them for me! i left a separate comment about the details. Your baktus is perfectly simple! It'll look great this spring with a variety of outfits. As always, you are an inspiration of clean, elegant simplicity. thank you, katie! clean, elegant simplicity such a high compliment to me! thanks iris! i left the info on them down below in case you were interested. love it! this is totally perfect for spring. on the queue it goes! julia, you should! it's so fun! i'd say it's mindless, but i obviously needed to pay a little more attention than i originally did! that yarn color is so lovely! i also had the same uh-oh knitting moment and had to unravel far too many rows. i guess that's what happens when you're brain is on auto-knit. it's crazy nicole because i have been knitting to stay sane while i get better, but my brain is so dumb right now! i've been ripping out stuff left and right. i just finished ripping out a pair of socks at the office! whatever, it's always good for my lazy self to learn the patience it takes to do something right. ladies, thanks for all your encouragement! it's so nice to know that the easy, simple stuff is appreciated too. i highly recommend cotton on this one for anyone looking to knit their own. peaches and creme is so easy to get your hands on, which is nice. i got a couple questions about my sandals too, but i'm realizing now they were emails, not comments. for anyone who's wondering though, the sandals are gee'wawa maria fisherman in grey leather. i really love them, but i'm still working on stretching out the toe width. i've got pretty wide feet though i guess, so if you've got normal feet, they'll be awesome! my feet are somewhere between a 7.5-8, so i bought an 8 and think they fit perfect in length. search around too, because you don't have to pay full price. a couple sites had other colors for more than half off! yours looks really lovely. i've come in full circle with garter stitch: as soon as i knew how to purl, i wanted nothing more of this 'beginners' stitch, and now, several years down the track, i don't think anything looks nicer. hi ellybeth! wondering how you are doing? missing you!~~ i hope all is well. Ellybeth, I have been a fan of your work for about a year and a half. I am writing you because I see that you have been away from your blog for a couple months and because the absence follows your reports of not feeling well. I am writing to share information that may be irrelevant to your situation or may be helpful. I so much wish someone had volunteered this kind of information to me years ago. An unfortunately common and frequenly undiagnosed health problem for women is Thyroid disease, in various forms. It shows up in a lot of unexpected ways (fatigue just being one of them), so doctors often treat secondary symptoms without catching the cause. One reason it goes undiagosed that the preliminary tests doctors use to screen for thyroid problems are not designed to catch a number of common and really troublesome thyroid disease indicators. People go undiagnosed for years with a big negative impact on their quality of life..., and a big improvement on their quality of life once they get treatment. If you have not already had all of these tests, it might be worth pursuing. The tests are TSH (most common for screening); FT3 and FT4; and Thyroid Antibody test (also known as the Anti-TPO)test. The key thing is that you can have a normal TSH test (the first one) and never learn about real problems with the other tests because often, if the first test looks normal, doctors don't give you the other tests. The additional tests can help identify all kinds of thyroid problems, including autoimmune thyroid problems like Graves or Hashimoto's diseases. I share this because it's such a rediculously common problem that frequently goes undiagosed for years. There is far more information on Wikipedia and About.com. Treatment is easy and makes life much better. Whatever your situation, I hope you feel better soon! Thank you so much for all the inspiration you have shared! I hope you are okay. Please take care. Thinking about you and hoping you are well. Hope all is well and that you're feeling better! Hope this isn't a weird comment, but I pop in from time to time since March, and hope you're doing okay! Just hope that all is well and that you're having a nice summer so far. looooove your blog. Following you. Been following your blog for quite some time now. I hope you are doing well this summer! I'm worried... Ellybeth has never been quite this absent on her blog. Is anyone a close friend of hers? I just hope all is well!!! it's a long long time since you "de bloged". Hope you're OK, healthy and happy.